Thomas wrote this poem for his dying father. It has the strict form of a villanelle consisting of five stanzas of three lines and a final stanza of four lines. The narrator is suggesting the way we should respond to the inevitability of death. Thomas has divided people into four types—wise, good, wild and grave—and the implication is that these are all the possible types of humanity. That is, some people are essentially rational in their approach to the world, some are moral, some are action orientated and some are serious. People who approach the world rationally have thought about death and know that it is inevitable, a requirement for life to have evolved. However, because nothing they ever said or wrote made any difference (‘forked no lightning’), when death comes they do not accept it as inevitable but fight against it. Good people see with hindsight that their moral acts were as nothing (‘frail’) and that if they had been better those deeds might have been ‘bright’. However, even then they would only have ‘danced in a green bay’, suggesting a bright flash of sunlight on the breaking crest of a wave. So, even the best people’s deeds last a fraction of a second and therefore they do not go gently towards death. Action orientated people (‘wild men’) may have performed the most amazing feats (catching the sun in flight) but even they see, looking back on their lives, that it just resulted in sadness and grieving so they also fight the coming of death. Serious people understand, too late, that their lives could have been different and they could have seen the world as a bright and happy place. But it is too late and so they also rage against death approaching. Thomas then discusses his father. Someone who has been sad, perhaps a serious person, a ‘grave’ man. He wants him now to react strongly towards his son, whether it is cursing or blessing him, and through that reaction fight against the inevitability of death. The Fermi paradox is the puzzling conflict between the high likelihood of finding alien life or signs of alien life on earth and the fact that we have found none. There are many explanations for this discrepancy (see Wikipedia Fermi paradox) but they ignore one important factor—self-replicating spacecraft. If we could build a spacecraft that made a copy of itself after it had landed then it can be shown that our galaxy, despite its vast size could be filled with such spacecraft in a few tens of millions of years. The key question is whether it will ever be possible to build a spacecraft that could replicate itself. Such a spacecraft, although we could not build one today, does not appear to require any breakthrough that is beyond the bounds of current science. If the human race could build such a device ‘soon’, that is within say a thousand years, then thousands, possibly millions, of other civilizations must have been able to build such devices before now. The earth should therefore be full of self-replicating spacecraft. I can hear you raising many objections but I think they can all be answered. This leaves the ‘Shafe paradox’ :), a subset of the Fermi paradox, ‘where are all the self-replicating spacecraft?’. The galaxy is very big so why do you say it could be filled in only a few tens of millions of years? Voyager I would take about 80,000 years to reach our nearest star Proxima Centauri which is 4.2 light years away. Assume that it is possible to build a self-replicating spacecraft (SRS) that is eighty times faster, about 1,300 kilometers per second, then it would take about 1,000 years. Our galaxy is about 100,000 light years across so it would take 24 million years to cross the galaxy. How many stars have planets or asteroids containing the material to replicate a SRS? If we assume one in 1,000 stars then our SRS will replicate itself every 1 million years. If our SRS makes just 10 copies each time then after 12 replications the number of copies travelling across our galaxy will exceed the number of stars in our galaxy, roughly 300 billion. After 100 million years our entire galaxy will have turned into self-replicating spacecraft. Is it possible for a spacecraft to survive in space for a million years? Not easily. It is possible a small craft could travel faster and it is possible more stars than one in a thousand have suitable material orbiting them. Another solution is that the self-replicating spacecraft is also self-repairing as the two requirements are similar. With suitable spare material and with multiple copies of each part when damage is detected in one copy that copy could be repaired. Why would any intelligent lifeform build such a device? Because it is possible. If only a small percentage of lifeforms built such a device then we should see them on earth. After landing on a planet to replicate could the spacecraft reach escape velocity? It may be sensible to never land on a planet as large as earth but to use the material from asteroids to replicate. We should see evidence of this is we examine asteroids closely. 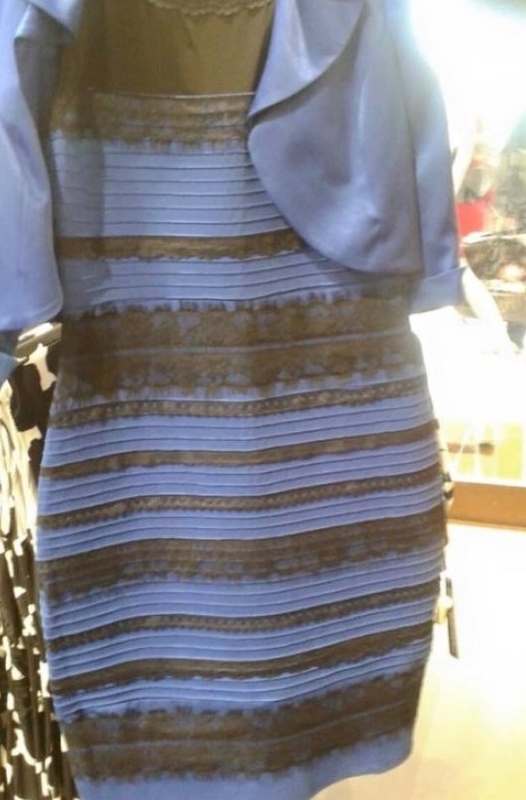 Some people see this dress as white and gold and others see it as blue and black. The dress is actually blue and black but this is irrelevant as the key question is why do some people see the dress in this photograph as one combination of colours and other people see it as another combination? The best explanation I have found is that we have all evolved to remove the colour of the light around us. In the early morning and late evening the light is reddish and at midday it is blueish. So to enable us to see the ‘real’ colour our visual cortex automatically removes the colour cast of the light falling on an object before we become conscious of the colour. In the early morning our visual cortex removes red and at midday it removes blue. What happens when we look at a photograph as there is no way of judging the colour of the light when it was taken? It seems some people are born to automatically remove red and some blue. One way of describing this is to say that some of us are midday people and some evening/early morning people. The visual cortex of midday people removes blue and so those people see the dress as white and gold but evening/early morning people remove red and so see the dress as blue and black.